Saltimbocca (also saltinbocca) (pronounced [saltimˈbokka]; Italian for jumps in the mouth) is a dish (popular in southern Switzerland, Italy, Spain and Greece) made of veal lined or topped with prosciutto and sage or basil; marinated in wine, oil or saltwater depending on the region or one's own taste. This dish is also occasionally topped with capers depending on individual taste. A common American twist substitutes the veal with chicken. 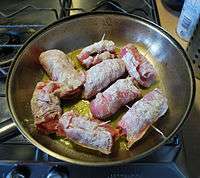 A version of this dish is saltimbocca alla Romana (saltimbocca, Roman-style) which consists of veal, prosciutto and sage, rolled-up and cooked in dry white wine and butter. Marsala is sometimes used. Also, sometimes the veal and prosciutto are not rolled-up but left flat. 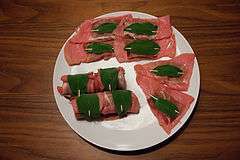 Wikimedia Commons has media related to Saltimbocca. Saltimbocca alla Romana A very popular Italian meat dish.